With all the holiday projects going on I have to admit my two knitting social projects, the 8,000 Feet Hoodie and the Stegosaurus, have fallen a little to the side. But I am happy to say I actually have progress to show you on the Stegosaurus, I finished the body. I’ve folded it in half and pinned it together so you can see the shape better. In my mind I thought this would be a small toy, but as I was knitting I went back to the pattern and saw it is actually 18″ long! So, it took a little long to knit than I thought. 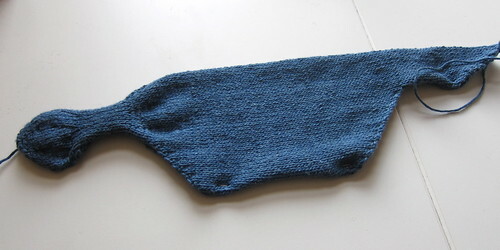 Not that the knitting was hard by any means, this is a simple flat project. It looks a little strange right now,but I’m sure once stuffed it’ll be much cuter. I have a lot of time in the car over the holidays and some good down time, so I’m hoping to have a lot of finished knitting come January. Has anyone else cast on for the Stegosaurus? If so, we’d love to see your progress on our Flickr group. Want to make one? 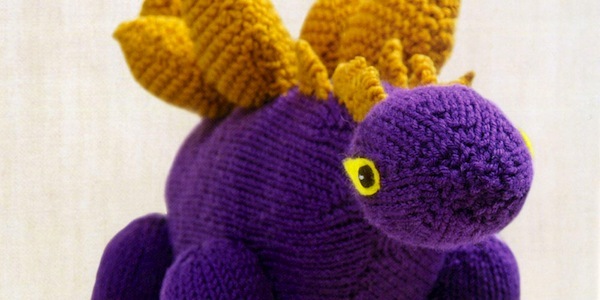 Thanks to by the wonderful folks over at STC Craft/Melanie Falick Books, we have a free pattern for it from Tina Barrett’s Knitted Dinosaurs. 7 years ago by Kat in Knitting , Knitting Socials , Needlecraft , Socials | You can follow any responses to this entry through the RSS feed. You can leave a response, or trackback from your own site. I’ve sewn a stegosaus many years since for my middle son, now 22 years old. The “scales” on the back were padded and quilted, and a complete pain to turn right side out. Looking foward to seeing your finished one. Aww, he’s starting to take shape!